The Escada store was temporarily located in the north corner of the space, formerly occupied by designer Valentino, while its new 717 Fifth Ave. store was being constructed. To create the double-height ceilings for the Valentino store, the apartment above was purchased and knocked out, but the southern half of the shop was still single height. Last year, retail deal maestro Jeff Sutton and partners SL Green Realty Corp. purchased the entire Valentino retail co-op for $66.25 million. In June, we wrote they bought the second-floor unit on the southern end of the building for $2.6 million, making a total $68.85 million investment. The second floor of this duplex apartment will be incorporated into the ground floor to carve out more high ceilings for the Alexander McQueen store, while a third floor space will remain an apartment. Sources said the designer will pay the princely sum of roughly $1,300 a foot over the life of the 15-year lease, or about $65 million. 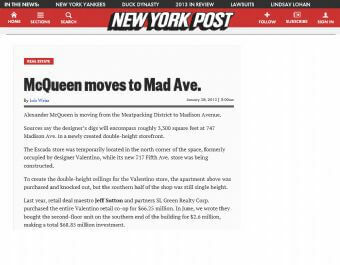 The exit of Alexander McQueen from the Meatpacking area follows a similar move by Stella McCartney from 414 W. 14th to what she called grown-up SoHo at 112 Greene St. Retailers in MePa complain that the droves of High Line Park visitors are nothing like the 6-inch, well-heeled fashionistas who used to make the taxi trek to Jeffrey. Alice + Olivia is now open in the former Stella McCartney store, while retailers like Lululemon and Patagonia have joined the 14th Street lineup that includes Apple and Levis. Susan Kurland of CBRE represented Alexander McQueen, while Suttons New York City Prime handled the building on Madison Avenue. Sutton and a rep for McQueen did not return calls for comment. Kurland declined to confirm or discuss a possible deal but observed that between the nightlife, shops, offices and High Line, the Meatpacking area is attracting an international crowd and a mixed bag where you have every demographic. Madison Avenue, Kurland purred, is luxury.